The rice is one of the traditional cooking healthy and delicious. Red rice is made from rice is cooked. This rice can be consumed by anyone from children to adults. Meaning of red rice is a little different from the usual white rice that we eat. There are other sensations can be felt. Delicious red rice would be nicer if eat you with pecel, stir fry and fried tempeh. For delicious, red rice also save millions. benefits. For children, red rice can improve brain development and strengthen the immune system. The content of vitamins and minerals in red rice 2-3 times more likely than white rice. Vitamin B1 (thiamine) at red rice to prevent beriberi in children. The iron content was higher so it can help children between the ages of 6 months or older that iron breast milk consumption has not yet been implemented. Fiber red rice to cope with the stomach. Not only that the benefits of the rice, but according to experts in research of rice contains antioxidants. The content of selenium in the Act of red rice as antioxidants to prevent the occurrence of cancer in human beings, especially colon cancer. Besides its benefits, it turns out this rice also has a promising business opportunity. 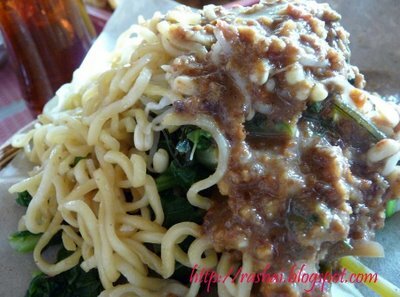 Now of course, the people began to concern for the health problems that the food certainly will choose healthy foods. Because red rice is a traditional culinary past, then many people will be enjoying red rice for reasons such as "nostalgia". Red rice can be combined with various side dishes available such as salted fish, fried tempeh, pecel, tofu, stir fry, etc. Opening the red rice stall giving new nuances in the culinary world. In addition to preserving our culinary culture, red rice is a healthy society and provide financial benefits for the owner.